What's the real score between these two childhood friends? Well, the usual thing with childhood friends is that they often end up together (e.g. Yusuke & Keiko of YYH, Kamui & Kotori). Such is not the case here *_*. These two have been at it since they were in diapers <_>;;;! Fuuko in particular, who has been dying to put Recca's ego several notches lower. He's the only guy she could not beat. She almost did it with the fuujin, though. But it was a battle not meant to be won. Otherwise they'd already be a funeral service on episode 3 @_@! If it was me and I have seen the first few episodes of FOR, I might've thought Fuuko had the hots for Recca and was jealous of Yanagi for getting to him first in a short amount of time (while she had known Recca for years!). There's a big possibility there! It's not uncommon for females to fall for their childhood friends, even if they say "Oh no, he's ugly. I hate him!" They usually feel the opposite and use anger and denial as defense mechanisms. Do you think she was secretly in love with him? In the manga, Fuuko claimed to have been *jealous* seeing Recca and Yanagi together. Though that isn't the case now is it? Fuuko had learned to overcome her resentment with Yanagi (as early as episode 3) and they're pretty good buddies now. So even if she was indeed in love with Recca, she was over it rather soon. 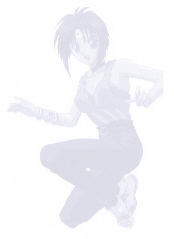 Apparently, she also got over her all-consuming desire to make Recca kiss her feet. Call it a streak of maturity. She's become his close friend rather than his sworn enemy ^^. There are a few advocates of a Recca-Fuuko pairing out there. Though seriously I doubt it would materialize. Recca seems to prefer more uhrrm, passive female types. And you and I know Fuuko-sama is anything but that. No question about this one. Domon is obviously smitten over Fuuko. And why shouldn't he? She is after all, a very attractive girl. He makes no secret of this, asking her out on a date every chance he gets to, and makes a pass every now and then. Unfortunately for him, Fuuko brushes him off like a fly. While she cares for him as a friend, it appears she couldn't think of him as a *gulp* lover. Sorry Domon *_*. Fuuko once commented that Recca & Yanagi have a bigger chance of getting together than they would. This is the opposite of Domon, as he cares for Fuuko very much. Too much in fact. He's willing to risk life and limb for her. He gets emotional when she gets hurt and tries to rescue her whenever she gets into trouble (though he isn't always successful). He even cried when she was under Kage Houshi's spell, and he made numerous attempts to break through her tornado to save her (aaaww....) Domon is actually Recca's best friend/worst enemy (both, if you ask me), but when Yanagi came into the picture, he became closer to Fuuko. They even trained together for a whole month in the mountains, using their newly acquired weapons. Really now, Domon, why didn't you take advantage of that time alone together? Geez! And what about this fine specimen of mankind? Isn't he the most gorgeous thing (drool, drool, drool...)? I have come across fans who wanted Tokiya to pair up with Fuuko. I'm not one of them (So you see it's NOT Tokiya I'm cheering for). Tokiya is rather, uhm, self-sabsorbed. He wouldn't be at peace until he gets to his sister's murderer. So I don't think there's any room for a little romance in his life. Not now anyway. He doesn't even seem to feign interest in any female other than Yanagi...and that's because she's a near carbon of his deceased sibling. Though I've got this suspicion that he does care for Yanagi not in the "sisterly way." He could be rivaling Recca for her affection. What does he feel for Fuuko? Errr...nothing *_*, nothing that could lead to a trip to the altar, that is. Well, respect maybe. He just doesn't say much or doesn't speak often, but you can tell he respects his fellow Hokage ninja. He knows she's good at what she does, and I don't hear him criticizing Fuuko as he would Recca and Domon. Tokiya knows how to treat a lady, ne ^_^? Friend, period. A team-up of these two is very unlikely. Saicho, for one, is younger than Fuuko (I can't imagine her being the cradle-snatching type ^_^). I put him here because he was really nice to her. Saicho's got a girlfriend, Kukkai's daughter Misora, who has an amazing resemblance to Fuuko (down to the headband!). Immediately after Fuuko's match, he comes up to her, apologizing for his teammate Fujimaru's behavior (what a *sick* a$$h@le!). He asks her not to judge their team because of one rotten member. Saicho had taken off his cloak to conceal Fuuko's near-naked body and he even wrapped her wounds with the paper bandage from his hands (isn't he such a sweetie ^^?). Saicho also had a run-in with Fuuko on the registration day of the tournament, and he immediately apologized and helped her up. Isn't he a sweet kid? Now if only Fuuko was a little younger....or Saicho a little older...hmmmm. No, it's NOT Saicho I'm cheering for either. At this point I'm taking in a few tablets of Metoclopromide to prevent myself from vomiting. He has got to be one of the most despicable characters in this series. He ranks no. 3 in my list (with the first one being Mori Kouran and Mokouren falling behind a close second). Even the annoying Genjuroh is more likable. This guy faced Fuuko in the opening round of the Urabutosatsojin. He was eventually defeated but not before he nearly stripped Fuuko of every piece of clothing. He stayed behind to watch the tournament among his fellow Kuu in the audience. During the quarterfinals, he waves a flag declaring "Fuuko Fan Club." He even screamed, " If you beat Gashakura, I'm your slave forever." (*_* Gosh Fujimaru, what a *tempting* offer). He also promised to take care of her in the hospital, just in case Gashakura beats her (no wonder Fuuko won, what a motivation!) Apparently he begins to look at Fuuko from another angle. Like...he's probably developed a crush (*gross*) on her. Yeeeew! But then he got pissed when Fuuko said he was lame opponent ^_^. Either way, I think Fuuko would die first before she could ever think of this guy as a potential partner (*goosebumps*). How thoughtless of me to forget this cool ginormous monster of a man *_* if he is one...but then I suppose he is, seeing his brother is human (Magensha). Fuuko's second opponent in the Ura Buto Satsoujin since she was not able to participate in the battle versus Uruha Maboroshi. The one opponent who showed Fuuko respect as a fighter. And apparently the only one who *isn't* a pervert. Dealt Fuuko-san with one of her most memorable and best battles in the entire anime series. He is one cool dude ^_^ (which is why I adopted him!). A great fighter even if he lost. No I don't think he developed a crush on Fuuko-san likethe others ^_~. His admiration for her is as a good fighter. I should've paid attention to the picture *_* more! I would like to rectify this mistake, ladies and gentlemen. That guy at the background is NOT KAMUI. It was until I was re-editing this pic that I got a real good look at this creepy character. It's no other than Soukakousai! Still of the Uruha (Ura Uruha to be exact). This guy has not appeared in the anime, but had come upon the volume 17 of the manga. As Fuuko was coming from school, he creeps up behind her and steals her ice cream cone. He says this is an "indirect form of kissing." Blech! How *sick * can these villains get anyway? What a bunch of pervs! He's interested in Fuuko. Apparently in love with her ina lustful manner. He is one of the new villains in Flame of Recca, a member of the Uruha assassins. This guy gives me the creeps. He looks like that "Flying Bat Man (Henya)" Yahiko (Rurouni Kenshin) fought in Aoiya. I just hope he doesn't get his claws on her. Yeeewww! Fuuko: Hey! Why did you save us? Why didn't you kill us? Fuuko: Do you mean we won't face each other in this tournament? (You suppose she was glad she didn't have to fight him ^_~). Raiha: No. (And with that he makes his exit). Weeee ^_^! And then I find out, courtesy of another FLAME OF RECCA SHRINE, that Fuuko gets trapped by Soukakusai in a cauldron. (Soukakusai is a member of the new Uruha Assassins since the original Uruha Jyusshinshuu disbanded after the Urabutousatsoujin. Now whoever gets trapped in this cauldron remains there, gets the life drained out of him, until that person turns into a husk (all dried up <_>). And guess who comes to her rescue? Not Recca, not Domon, not Tokiya, but RAIHA! Now why the heck would he do that, if he didn't have a reason? I guess that's his subtle way of telling her how he feels ^_^. Or has he told her how he feels in the manga? Either way, I hope they get together in the end. They'd look so cute together! Although he is from the Uruha Jyusshinshuu, Raiha is warm, gentle and rather affectionate. I mean...just look at him! You might be inclined to think he's harmless. But he's not. It's that amicable appearance of his that serves as his most dangerous weapon. He can kill in an instant, and he's more powerful than he looks. He fights as a one-man team in the Urabutousatsoujin. He doesn't even use his raijin for fighting! He said, "It's not time." (which seems to be his favorite line). Apparently, he's saving the raijin (the God of Thunder) for that day of destiny when Fuuko goes head on against him with the fuujin (the God of Wind). Incidentally, his name means "Thunder Champion." Raiha has a strange relationship with Fuuko, more defined in the manga than in the anime. If you notice (and I definitely do), he seems to have quite some knowledge about the "fuujin." When the "Spirit of Wind" first appeared (those furry flying animals from the fuujin), Raiha quoted, "So, finally, they have chosen to appear." You can also see Raiha at the arena when Fuuko turns to fight, instead of watching her from the screen in Kurei's quarters. Heck, he was even at the corner of the Hokage Ninjas during the bout between them and the Uruha Kuranei. In one episode of FoR, prior to Kurei vs Raiha quarterfinal bout, Raiha says to Kurei, "Allow me to remain as the caretaker of the Hokage Team." (He said this after withdrawing from the battle against Kurei, in respect of his Master). So what is the real relationship between Raiha and the Hokage Ninjas? Til then...my interpretation of the Raiha-Fuuko "relationship" can be found here. . They look good together. She looks boyish, he looks girlish. She's got short hair, he's got long hair. They both wear headbands. She's bishoujo, he's bishounen. Their personalities compliment each other. She's brash and hyperactive. He's gentle and soft-spoken. If Fuuko ended up with someone whose personality is as strong as hers, they'd be bickering til they're senile. What she needs is a partner with a more subtle personality who can balance her out. He saved her life twice. That's got to count for something. And he saved her from his own, the Uruha Jyusshinshuu. Destiny says so. Why is his weapon complimentary with hers? It could have been Kaoru or Tokiya who could possess that fuujin. But why Fuuko? Destiny, I say, destiny. Really now, take your pick. Domon or Raiha? It's Romeo and Juliet all over again. Two star-crossed lovers from opposites sides of the fence. Though not all romances like this end up tragic. Look at Richard and Erika (Daimos), Max Sterling and Samantha (Macross). They should get together because of an "incident" in manga issue no. 20...*_*. Willy actually mentioned the "incident" but I'm not saying it here.....it's too...uhhh...well...just read it, okay? They shouldn't get together because...and I quote, "Fuuko is mine!" YOU KNOW ANYMORE REASONS WHY OR WHY NOT THEY SHOULD GET TOGETHER?MAIL ME!